According to a recent Gallup poll, only 18% of Americans say they approve of the work this Congress has done -- so it's more than likely it won’t go down as one of the more popular congressional bodies. 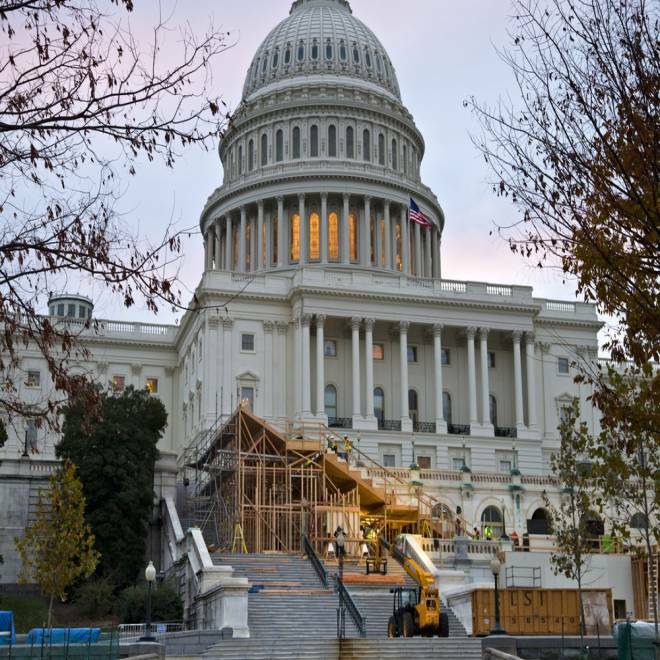 Construction continues on the viewing stands for President Barack Obama's January's Inauguration Day ceremonies, early Wednesday, Nov. 28, 2012, on Capitol Hill in Washington. But with only weeks to go before it concludes, the 112th Congress (2011-2012) is on track to make another type of history. By passing just 196 bills into law so far, it is in the running to become the least productive Congress since the 1940s. In fact, that amount is 710 fewer public laws than was produced by the 80th Congress (from 1947-48), which first earned the moniker "Do-Nothing" Congress. The lack of legislation passed by Congress in recent years has become frustrating to many lawmakers. Outgoing Sen. Olympia Snowe (R-Maine) decided not to run for re-election because of the congressional gridlock, partisan politics, and lack of work being done on Capitol Hill. Rep.-elect Ann Kirkpatrick, D-Ariz., and Rep. Sean Duffy, R-Wis., talk about the possibility of a bipartisan deal to avoid the fiscal cliff. “As I have long said, what motivates me is producing results for those who have entrusted me to be their voice and their champion, and I am filled with that same sense of responsibility today as I was on my first day in the Maine House of Representatives. I do find it frustrating, however, that an atmosphere of polarization and ‘my way or the highway’ ideologies has become pervasive in campaigns and in our governing institutions,” Snowe said in a statement announcing her retirement last February. The U.S. House Clerk’s office keeps official records of all congressional activity dating as far back as 1947. During those 65 years and 33 different Congresses, more than 20,000 public laws have been passed. The 104th Congress (1995-1996) currently holds the record low for passing the fewest pieces of legislation since 1947 -- just 333 bills were passed into law during that two-year span. A non-partisan group determined to fix the sky-rocketing national debt went to Capitol Hill Wednesday, meeting with both Republican and Democratic leaders. David Cote, chairman and CEO of Honeywell, was among the leaders and he recapped the meeting to NBC's Andrea Mitchell. The 107th Congress (2001-2002) is next, passing only 377 new laws during its time in Washington. To avoid earning the distinction as the least productive Congress since 1947, 138 bills must move through the House and Senate before the end of this Congress next month. And with just 11 scheduled voting days left before the House’s target adjournment date for the year -- and with all eyes fixed on the looming fiscal cliff -- time is running out.